A week can both be a short and long time depending on your perspective, but when in that time frame, you've played a game to the exclusion of any other in our hobby, it can be a good litmus to test how one's first thoughts are standing up. In writing this follow up, I hope that many more people have begun to get this game into their hands too. After 12 play sessions including 2 learning bouts - all solo mind you, I can happily say that I've managed to play 3 games (actually zero - see below regarding my interpretation of Sieges!) without breaking the rules once! This is more a symptom of the solo game player - sometimes it's good to have another mind at the other side of the table, if just to take over managing the opposition's armies, and cast a scrupulous eye over the map so things don't get missed. That said...! Everything is holding up fine. It may be a good idea to coat the blocks and labels once stickered with some sort of lacquer, as they do bang around a bit in their draw bags, but other than some small white corners (borne purely from separating the black stickers from their sheet actually), everything still looks pristine. The map can be scraped with blocks (and in my case glass stone markers) ad nauseum. It's rough texture is robust indeed. One of GMT's best map renditions actually. Well, it's not that the rules are complex - believe me they definitely are not, but I've referred to the rule book at least once a game. The player aid is 95% complete, but it's good to have a re-read of things just to make sure I've been doing things right. In my case: who gets the 6th card at the start of the week; who gets the extra reinforcement block, force marching, special attacks and taking losses in a Siege. All very easy concepts to grasp. The only situation that I think I'm doing right, but only alluded to in the rule book came up tonight actually: If both sides tie for Impact generated at the end of a Battle - who is the winner? The rules mention, as a general aside that "ties favor the defender: and on that basis, Ishida -himself- just held on to Kyoto under attack by Tokugawa -himself-, with each stack comprising two 3-mon blocks from unrelated clans. It was a beautiful moment indeed. I (as Ishida) still lost the game... And that just amazes me entirely! Sheer beauty. The mon blocks and cards, the movement limits and road limits, the movement benefits bestowed by Daimyo's, the inability to resolve a Siege on the turn of declaration, the ability to retreat into Castles given the correct size of stack, the confluence of varied clans in a battle, the switching of loyalty and the vulnerability of the Ishida and Tokugawa blocks - all to me - give this game immense period flavor. A very satisfying, heart pounding experience indeed: And again, I'm still only playing solo at this stage. To augment the game, I cannot recommend the designer's historical notes more highly enough. I bought Osprey's War in Japan 1467-1615 for background. The designer's notes do more to explain the period and what the game aims to simulate than 90+ pages of that book ever did. Trust me on this save your money, skip Osprey, and buy an extra game - or something to supplement this one like wooden tokens to dot the map (refer my post http://www.boardgamegeek.com/thread/693710/hard-to-find-cast... to see what I mean). Running a turn is lightning fast. There is a definite "one more go" feel to the game. You spend your time thinking about strategy and methods of attack, rather than interpreting rules or keeping track of logistics. You try to work out an order to fighting multiple Battles and Sieges within a turn - because after each, you get to replenish your hands, and may therefore be able to gamble in making contact with a less than optimal hand at the start - only to receive the cards you need by fighting an action prior... All movement precedes all combat. The map in the west is the hornet's nest of the game. In the triangle from Osaka in the west, to Gifu a little bit east, and south to Okazaki, there are 4 Castles, 2 Resource Locations and 2 Recruitment Boxes. 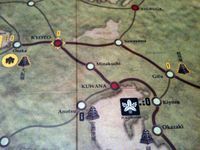 This small area compared with the expanse of the game board, will receive masses of attention - particularly considering that one of Tokugawa's Automatic Victory objectives, sits at Osaka Castle too. To assist play, optimally, it would have been desirable to have expanded the playing area in this locale. However, I'm not certain whether the distortion of the map to do so, would have ruined the game's aesthetics. Therefore, just be aware that large and numerous stacks from both sides may loiter here, and be careful not to tip things over as the excitement grows! Moving blocks in combat off the map, and marking the contested location as in my post mentioned above, is one solution. You may have others. I've been playing this game non-stop since bringing it home. Yes, it's good to know finally, that I haven't broken any major game conventions in my last 3 plays - and the most recent game that just finished came right down to the wire: Ishida and Tokugawa themselves fought each other no fewer than five times from Ueda all the way back to Kyoto. On two occasions, both leaders were left on their own - their stack losses taken were so huge. And with a right hook on the very last turn, Tokugawa took back the Resource Location of Tsuruga with a solitary one-mon Maeda cavalry unit - and won the game! Damn - I lost again - against myself - and was smiling from ear to ear. However, in all this there is a danger. There is only one scenario to this game - and whilst nearly half of each play session's starting forces will be chosen at random, repeated play without a break may cause the novelty to be lost. For this reason, I'm going to give the game a break for a few days, and by then my other half may just join me for some face-to-face play. Thing is, I don't feel that taking a break is a bad thing (well, I'm actually playing it asap to see what it feels like playing Sieges right!). The game is truly so well crafted, that honestly, I want to play it again right now - the "strategic dilemma" is just so engrossing. Sekigahara is not comparable to another fairly elegant, yet simpler GMT title, released a couple of years ago - Manoeuvre. Though that game allows the player to lead eight different armies, each game would basically boil down to the same thing every time: meet in the middle of the map and fight. To me, it soon became very stale. Sekigahara, may eventually result in this feeling. Yet, its routes to victory are varied enough and sufficiently unpredictable, that its challenge may stay fresh too. I have had no desire to play Manoeuvre in the past year. If I put Sekigahara away now just until next week, I know that I will want to play it eagerly. Those playing on the weekends or at club gatherings should not encounter this experience for quite a while. Though could this game use another scenario? A variation on the campaign? Extra weeks of play? Different victory conditions - or even greater plausible randomization? I'll have that answer in about a month's time. It's just that up till a couple of days ago, I couldn't believe that Ishida could ever win - and being "my guy", in my solitaire games, this was disheartening beyond belief. Was this Manoeuvre all over again - Ishi just awaits the Toku onslaught? Then I read how some people were getting roasted by Ishida, and the designer himself commented how powerful the Ishida side could be. I re-evaluated my performance and in the last 2 games, have come ever so close! The trick? Apply the rules properly (yup), and be aggressive! I think (and given that the randomization of fate falls my way), I'll soon pull an Ishi win off; and so, next week, I'll be sweating to see. I'm giving the weekly Turn Order benefit to the side that is losing in Victory Points at the start of each week (both sides will then discard a card of choice, as if they had played values to this effect). A 1d6 will then be rolled. A "6" will swap the first move/combat for that week to the other side. If a side holds a Loyalty Card, it may play it as normal on defense at any time. A 1d6 will then be rolled. A dr of 5-6 will nullify the card play, and that card will not be eligible for play again that Battle. Other than that, I'll continue to draw all cards for both sides face down, and inspect them only as the need arises. Both sides will continiue to be played to the best of their abilities. Like I said, I've still got to "win"!! So that's a re-evaluation of my initial thoughts on the game. It's proving solid with no errata as far as I can tell. Just the one rules interpretation regarding tied Battles to clarify, and robust components hold everything together. EDIT: See my post below regarding the attacker's confirmed ability to fight out a Siege the turn it brings one about. This may affect the balance and outcome of the game hugely. Will report how it goes. At least in the PDF rules available currently (admittedly not final), this is not really an allusion but is written quite plainly: "A tie in impact favors the defender". So, the attacker in the drawn battle loses one block in addition to any lost as a result of impact. What do you think of this comment in another review, Adam? "The excellent simulation is where the largest problem is with the game. Looking at the starting map one can see why the battle progressed the way it did. Ishida (gold) is prone to defense as they have an advantage in two castles and (with the exception of Uesugi) the daimyos are close together. Tokugawa (Black) has the primary goal of capturing Osaka castle where the Toyotomi is located (and can’t move from) which is Tokugawa’s instant victory condition. The Date and Uesugi skirmish on one side of the map while the Tokugawa host travels the highways towards Osaka for a final showdown (skirmishing along the way). There are some minor variations to this, and it can be fun to try, but with limited movement options (only three paths from one side of the map to the other) there are too few variations to have a good amount of replay value." Jay, it's really funny for up until today that is exactly how I thought too. "Ishida must attack. Concentrate in Kyoto and then dominate the west. Maybe make a mobile northern force around Nagaoka. Don't give Tokugawa the leisure to overcome his problems of distance and dispersion." And it opened my eyes! With the right random blocks for extra punch (luck of war? ), Ishida has a real chance to go mobile early. This really is a game of "who'll blink first". And then second, and third! Very unpredicatable if you have the courage. But that said, Tokugawa starts the game up on Victory Points, because he owns more Castles. 1. Remember to ensure that the loser in a Battle takes an extra loss at the end. 2. Castles revert to their orignal owner as soon as abandoned, so don't forget the garrison your conquests. 3. Defenders can retreat into a Castle after a Battle. 4. You can't fight a Siege on the turn it commences. 5. You can't Overrun units at a Castle. 6. Reinforcements can't move on the turn they are placed but they can participate in a combat that eventuates at their location. These make all the difference to defeating a cocky enemy. And then Ishida has the Mori - costly to recruit but what a punch. EDIT: Confirmed with GMT, there is no restriction on fighting a Siege the turn the attacker brings one about. Nice review, Adam. I'm still waiting for a chance to teach it to my husband. An easy way to remember who gets the extra card and extra recruit: use alliteration. There is grandeur in this view of life, whilst this planet has gone cycling on according to the fixed law of gravity, from so simple a beginning endless forms most beautiful and most wonderful have been, and are being, evolved. Missed this. Thanks for the reminder. then no battle or Siege Combat occurs in this location this phase. Only if the active player owns the castle and remains inside. This means that on your turn your besieged blocks do not undergo siege combat, but you can have them fight a field combat if you so choose. This may be a difference between the rules as published and the "near final" PDF rules which are circulating right now. I'd be interested to find out what the differences are, as I'm learning the game from the PDF but already have the game on order through my FLGS and would prefer to learn the rules correctly from the start so I don't develop a habit of doing it incorrectly. Mary, I am in awe of you! The way the rules are written, I suspect you can start a siege the turn the defender retreats into the castle. Rule 8.9.2 - When combat is declared and not before, the side that owns the castle may choose whether to be inside or outside... If outisde a battle occurs; if inside - a siege. I consider the side making this decision to be the "Active Player". As Sieges are meant to slow the attacker down, there would be no point for the defender immediately electing to move inside one (a Castle), only to not be able to play any cards, whilst the attacker immediately resolves the Siege straight away in response. You might as well stay in the field and not play any cards in defense! Same outcome. Edit: Except the defender gets the benefit of only taking losses for every 7 Impact received when in a Siege... hmmm. Let's ask Matt! Also draws a card per block lost, instead of per two blocks. Actually, in the rules I'm reading (the "near final" PDF), it appears that whether it is a battle or a siege, blocks are lost per 7 impact. Are the rules you have different in that a battle causes losses more easily than a siege? If so, what are the values necessary to deal damage in your version, and is that the newest printed version? The "active player" would be the one whose turn it is to Move and Combat. If you're in a castle and decide during the Move phase not to leave it, then you do nothing at that location during the Combat phase. You're sure not gonna throw sticks at the attackers and taunt them: "your mother was a jellyfish and your father smells of elderberry wine" so that they attack during your turn. Edit: Another advantage to the defender in a siege is that the attacker can no longer play guns and cavalry Special Attacks. You're welcome. I had the same problem with remembering which was which so had to resort to that old trick. Actually, in the rules I'm reading (the "near final" PDF), it appears that whether it is a battle or a siege, blocks are lost per 7 impact. That's still correct, except the loser of a Battle also loses an extra block for being a loser! I thought my mother was a hamster. Totally correct - Rule 8.2.1 defines the phrase "Active Player"
Further all, please note my adjusted comments above. The attacker can definitely fight a Siege on the turn it causes one to come about. Confirmed with GMT. 1. Wow - this will definitely change the way the game playes for me. 2. It also means that I have yet to play even 1 game with the rules right! Yes, this is true. The attacker may prosecute a siege the same turn he arrives at the castle. This is really important for Ishida, as it makes the weak Tokugawa castles in the West vulnerable in the first week and casts into doubt which side will own the majority of castles at the outset of week 2.